In 2013 and 2014, Jarrett Walker + Associates joined the Traffic Engineers, Inc. team in a redesign of Houston METRO’s bus network. 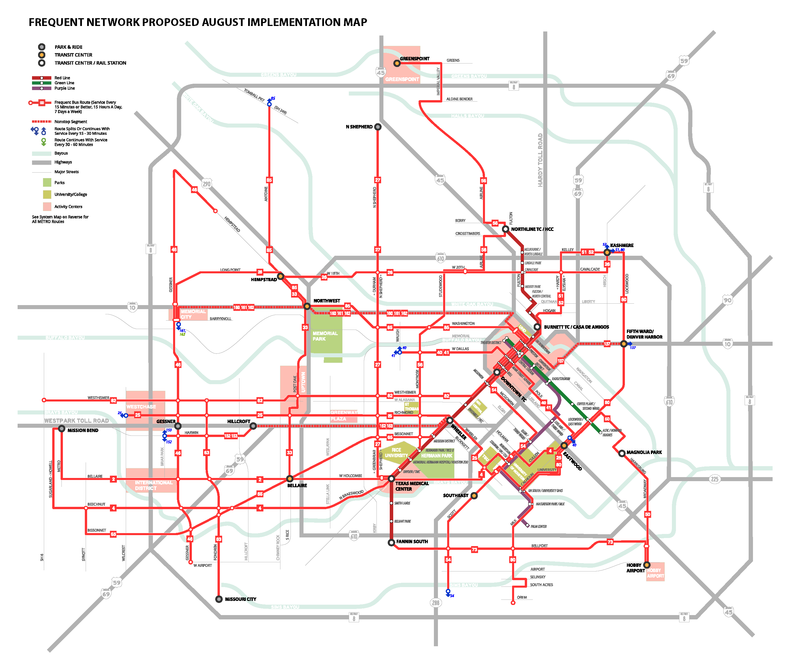 Unlike typical network reviews emphasizing incremental change, the Houston project was called a System Reimagining. The scope specifically demanded a clean-slate rethinking of the entire network, not just because Houston had changed but because Houston’s expectations of transit were changing. The system needed to be reset in a way that broke through perceptions that service was only for the most desperately dependent riders. JWA played a major role in all phases of this project. The firm led a group of consultants, METRO staff and Board members through a core design process, culminating in a major public communication effort and the development of a 5-Year Transit Service Plan. The resulting network was adopted by the Board in February 2015, and implemented in August 2015. This dramatic transformation connects 1 million people and 1 million jobs with high-frequency all-day service, with no substantial increase in operating cost.